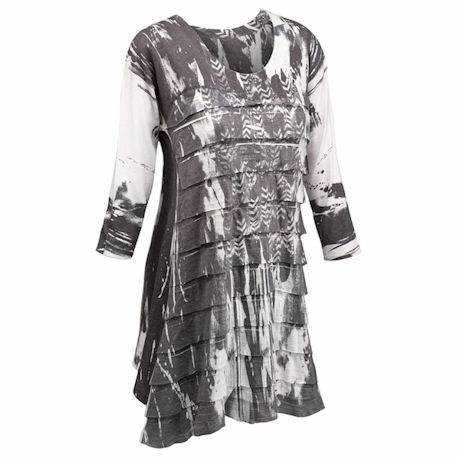 Turning traditional girly ruffles into a power play, this top takes an edgy black-and-white feathers print and slices it into textured layers of light weight knit fabric; fabulously soft and ultracool, it's great as a long tunic or short dress. ¾-length sleeves. Machine wash. 50% polyester/ 50% rayon. Made in the USA. S(6-8), M(10-12), L(14-16), XL(18); 34"L.